So this technically isn't a recipe, but it was too tasty, too pretty and too easy to keep from you all. Pair it with a glass of red wine and you'll be set for the evening. Or if you have guests stop by for a last-minute visit, this is perfect to set out on the table for everyone to enjoy. We usually have an assortment of cheese and pepperoni in our fridge, which always comes in handy for last minute hosting duties. Chris and I even replace this for dinner once in a while. It's filling, but not too filling that you feel like you overdo it. Plus if you eat the cheese, meats and olive mixture without any bread or crackers, it's also low-carb and gluten-free. We got inspired to make this after ordering a large antipasti plate at a local restaurant one evening when we weren't hungry enough for dinner, and we found it's just as easy to recreate it ourselves at home. Plus it's a fun stay-at-home date night idea. Enjoy! Slice Cheddar cheese and pepperoni. 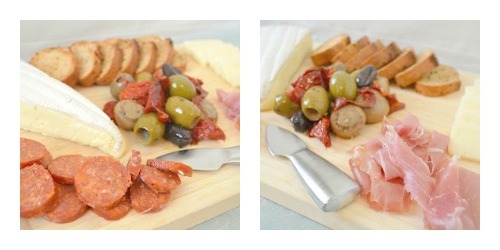 Place on a serving platter with Brie Prosciutto and olive assortment. For crostini: To make your own toasted bread, buy a loaf of french bread. Slice into thin pieces. Lightly spread with olive oil and a sprinkle of Italian seasoning (or any season you prefer). Toast on a baking sheet in a 400 degree F oven for 10 minutes or until lightly browned, flipping halfway through. For olive mixture: Buy an assortment of olives, canned whole mushrooms and canned roasted red pepper strips. In a small bowl, mix olives, drained mushrooms and drained peppers with enough olive oil to coat, plus a sprinkle of Italian seasoning and red pepper flakes. Allow to marinate and serve.